Part 1 of this series introduced the Planning Quality Framework – the antidote to target based performance management. Part 2 explained how we’d made the framework ‘modular’ and much easier to engage with. In Part 3 I’ll take you through what the framework actually is, explain a bit more about each module, how it all fits together and show you some of the newer outputs we’re developing. 1) Facts: What does the data from our management system tell us? 2) Opinions: What do customers say and think about us? The greatest compliment ever paid me was when someone asked me what I thought, and attended to my answer. 3) Development quality: How good are proposals and what eventually gets built? • Bespoke localised reports (we’ll send you a database so you can create your own bespoke, local reports). The content of the framework has been developed with the help of the sector. To date, approximately 20 councils have piloted the first part (data). We are currently, with their help, putting the finishing touches on the reports, benchmarked against others. 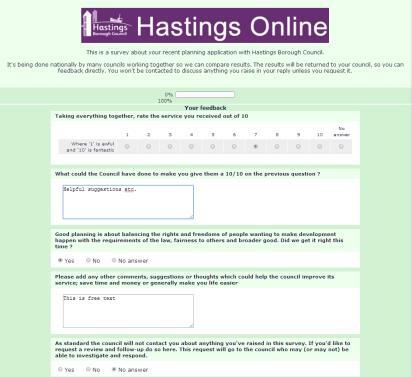 We are currently testing the surveys with the help of Hastings Borough Council. The surveys capture the views and feedback of a variety of ‘customers’ of the planning service including applicants/agents, neighbours, councillors and staff. The quality aspect is in two parts. The first is a review of the quality of the planning service itself – managers will review and score the council’s role (e.g. ‘did we negotiate well?’), processing specific applications. The second is a review of quality of the planning decisions on Major developments using a framework used by Camden and based on CABE’s Building for Life criteria. The “quality” parts of the framework will take time to filter through as we rely on councils to spend time collecting evidence about developments. This will also grow into something more valuable as we develop the framework to go beyond analysing transactions and get to thinking about whole developments. We can’t ignore costs forever either and may suggest a time-sheeting exercise every 2 or 3 years. 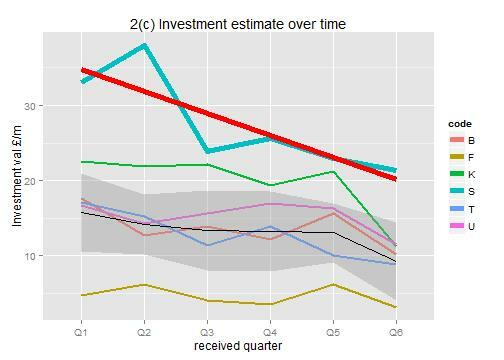 The ‘Investment estimate’ is based on the build costs for different types of development – these are just PAS estimates for now, so are illustrative only. In this example, the trend is that development investment is going down, but even at its lowest point, this planning department is managing development applications that represent a £20 million investment in this place. Powerful stuff. (ii) FTE Estimate over Time – how well matched are resources to work volumes? 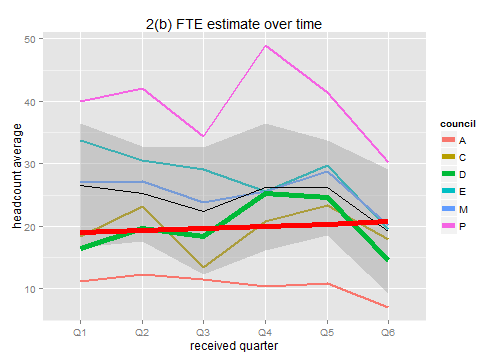 The ‘FTE estimate’ plot is based on PAS 2012 Benchmark data. 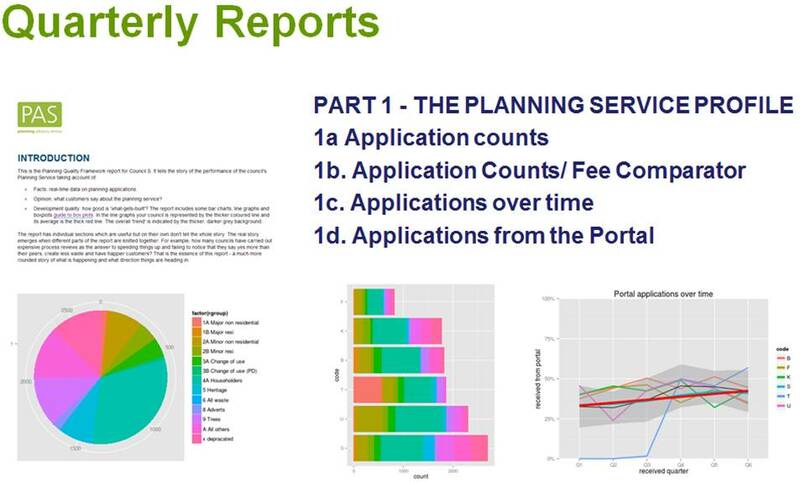 Marrying this data together with application volumes, fee income trends and the development investment data, adds a little ‘piquancy’ to many of the resourcing decisions facing the service. It may highlight a number of opportunities to re-focus resources. The above picture is for Householder applications. 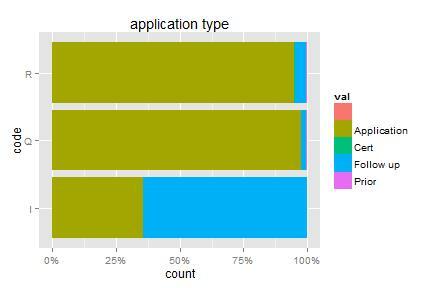 I hope that Council ‘I’ is having problems with its data rather than over half of its householder applications having conditions attached. In my previous blog, I introduced the Planning Quality Framework – the antidote to target-based performance management and a neat path to true continuous improvement. Since then I have had a number of people ask how the Quality Framework differs from our previous benchmark and, please could we make it a bit simpler? Well we have, in a number of ways. It’s modular, so you can choose how much you do. It’s not timetabled so you can choose when you do it. It’s low-hassle – the emphasis has moved away from cost so there’s no need to train whole departments to time-record and re-classify work, or learn the language that accountants speak in. Each module is valuable in it’s own right but is not the whole story. The real value comes when you draw all three together – how many expensive process reviews focus solely on speeding things up but fail to notice that the service says ‘yes’ more often than its peers, creates less waste and has happier customers? The quality framework reports will show a much more rounded story of what’s happening and which way the service is heading. Like most things in life, the more you put in, the more you get out. You don’t have to do everything at once or follow a timetable, but the more you do the better the value. Any timetabling PAS suggests will be so that we can provide support but it’s not compulsory. It’s a bit like the self-service tills at the supermarket – you can get on and away quickly but if you need someone to sort that ‘unidentified item in the bagging area’ or confirm your age, then you may have to wait. For example, we may suggest a customer survey in November but you already do one every June – fine, we’ll slot your results in when they’re ready. All together, once per year, and if you miss the boat – tough You just begin, when you’re ready. You then measure things that tell you if your service is achieving the former/avoiding the latter. 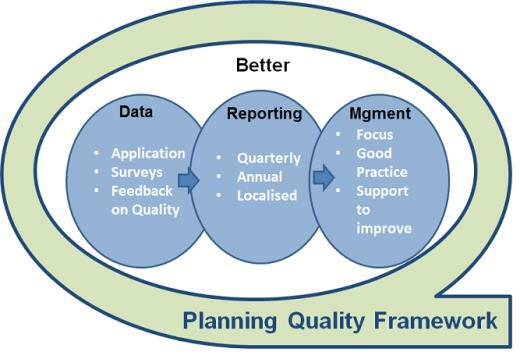 Well PAS is launching the Planning Quality Framework in September 2014 to see just how simple we can make this. act; understand, learn, experiment, improve. For too long we have been using words like ‘quality’ and ‘continuous improvement’ as adjectives – ways to describe what we are and what quality service is and looks like. It is time for these words to become verbs – something that we do and has associated action(s). So, instead of the Government, the Director or the bland set of words in the service plan describing what they think ‘good’ and ‘quality’ is, the framework gets the views of applicants, agents, neighbours, objectors, members and staff. They know much more about this. It creates more useful measures e.g. how long do things really take, how much certainty do you provide and how much waste do you create ? Then, most importantly for me, it produces reports for your ‘audiences’ – helping you tell them what’s happening and what you’re doing about the things they care about most.